Metamorphosis is a process by which animals undergo extreme, rapid physical changes some time after birth. The result of metamorphosis may be change to the organism’s entire body plan, such as a change in the animal’s number of legs, its means of eating, or its means of breathing. In species that use metamorphosis, metamorphosis is also typically required for sexual maturity. Pre-metamorphic members of these species are typically unable to mate or reproduce. Animals that you may not know undergo metamorphosis include fish, mollusks, and many other types of sea creatures which are related to insects, mollusks, or fish. Lobsters, for example, which are closely related to insects, do undergo metamorphosis as part of their life cycle. Metamorphosis is a remarkable process. The speed and extent of cell growth and differentiation is astonishing. In most species, such rapid growth and such sweeping changes to cell type only happen during embryonic development. Indeed, some scientists believe that the process of metamorphosis involves a sort of re-activating of genes that allow animal cells to change from one cell type to another. The changes leading to metamorphosis are triggered by hormones, which the animal’s body releases as the right conditions for metamorphosis approach. In some animals a hormone cascade follows, with the trigger hormone causing the release of several other hormones that act on different parts of the animal’s body. The hormones cause drastic changes to the functioning of cells, and even behavioral changes such as the caterpillar spinning its cocoon. The effects of hormones on metamorphosis can be studied by artificially administering these hormones to pre-metamorphic animals. Tadpoles, for example, can be triggered to begin losing their tails and growing limbs early by the addition of thyroid hormones to their water supply. Unfortunately this has a detrimental effect on the animal’s health. Scientists remain uncertain why metamorphosis evolved. For the animals of today, its purpose is obvious: if metamorphosis did not occur, tadpoles could not become frogs and larvae could not become full-grown adults capable of reproduction. Without reproductively mature members, these species would quickly die off. But why would these species evolve to need this extra step in the first place? Why not just hatch full-grown butterflies or frogs from eggs? At least some metamorphosing species did not start out that way: the earliest insects basically did hatch as full-grown adults. But a few hundred million years ago, some species stumbled upon the trick of metamorphosis. It was apparently wildly successful; it is thought that almost two-thirds of species alive today use metamorphosis to accomplish large changes between their adult and juvenile forms. The benefit of metamorphosis may lie in its ability to reduce competition. Pre-metamorphic animals typically consume completely different resources from their adult forms. Tadpoles live in water, eating algae and plants. Frogs live on land, breathing air and eating insects. Caterpillars eat leaves; butterflies live off of nectar. Etc.. This effectively prevents older members of the species from competing with younger members. This may lead more members of the species to successfully reach sexual maturity, without the risk of being out-competed by older members of their species. In complete metamorphosis, a larva completely changes its body plan to become an adult. The most famous example is that of the butterfly, which starts out as a worm-like, leaf-eating caterpillar and transforms into a flying, nectar-drinking creature with an exoskeleton. This transformation is so swift and complete that the caterpillar must spin a cocoon and lie dormant for weeks while its body undergoes these radical changes. Other animals which transform from a worm-like larval stage into an animal that looks completely different include beetles, flies, moths, ants, and bees. Some scientists believe that the larval stage of complete metamorphosis may have evolved from insects which hatched from their eggs without developing properly. Some of these embryos may have survived long enough to find food in the outside world; and this may have ended up giving them an advantage, as they would be able to feed longer and gain more strength than their peers before metamorphosing into the adult stage. Cockroaches, grasshoppers, and dragonflies, for example, hatch from eggs looking a lot like their adult selves. They do acquire wings and functioning reproductive organs as they grow, but they do not completely remake their bodies like their completely metamorphosing cousins do. Many of us may have witnessed the process of metamorphosis first hand, by raising caterpillars into butterflies in school. The idea of a worm-like caterpillar wrapping itself in a cocoon for weeks and then emerging as a beautiful butterfly is certainly strange. But the obvious changes of appearance, such as the growth of wings, don’t do justice to just how strange this process is. In the cocoon, caterpillars don’t simply gain legs, wings, and an exoskeleton. They also grow new eyes, lose their leaf-eating mouth parts and replace them with nectar-sucking proboscises, and gain mature reproductive organs. To accomplish this drastic change, a metamorphosing caterpillar basically digests itself. A great deal of energy and raw materials are required to turn a caterpillar into a butterfly. So to make it possible, caterpillars release enzymes that dissolve most of their bodies! Indeed, the hard shell of the cocoon is required not just to protect the metamorphosing insect from attack: it is required to keep its liquefying body bound together, lest it ooze away! Not all of the caterpillar’s cells are dissolved by these enzymes. Special tissues called imaginal discs survive – and they use the soup that used to be the rest of the caterpillar’s body for nutrition. By consuming the proteins, vitamins, and minerals – everything you need to build a butterfly – these imaginal discs are able to grow incredibly quickly, developing into the butterfly’s mature body parts. The new body has almost nothing in common with the old body. It has new legs, new sensory organs, a new exoskeleton, a new reproductive system. Even its digestive system does not work the same way, since it must now digest nectar instead of leaves. That’s all in addition to the beautiful wings. This radical change allows butterflies to complete their life cycle very efficiently, with no competition between adult butterflies and caterpillars for food. Many other insects pass through a similar process. They hatch as worm-like larva, eventually encase themselves in hard pupas, and emerge as adults with legs, exoskeletons, and other features that have little in common with the larva they once were. Bees, beetles, ants, and flies all use this strategy. The metamorphosis of a tadpole into a frog is a little less violent than that of a caterpillar into a butterfly, but the processes share some important common features. Tadpoles do not dissolve their bodies into mush; but they do “digest” them in a less spectacular way. Using the process of apoptosis – or “programmed cell death” – the tadpoles “order” the cells they don’t need anymore to shred their DNA and die. The dead cells are then cannibalized for energy and raw materials to make other cells. The cells of their tails are broken down and used to make their developing legs; a similar process happens with the gills, which disappear as the tadpole begins to develop air-breathing lungs. 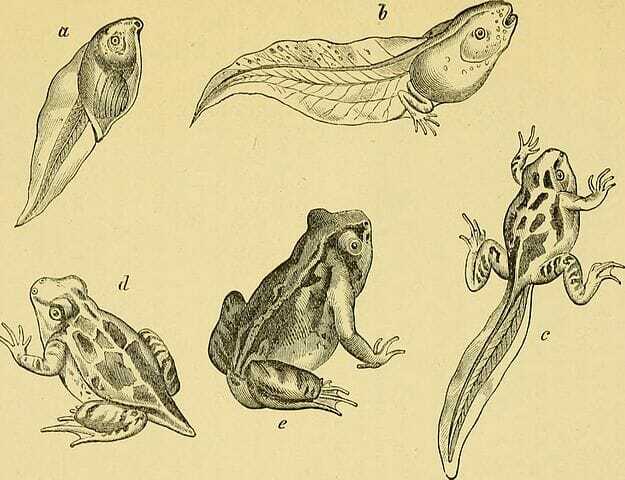 One interesting thing to note is that tadpole metamorphosis and insect metamorphosis likely developed separately; the common ancestor of insects and amphibians diverged long ago, and the ancestors of modern insects are not thought to have used metamorphosis. When the same phenomenon evolves twice in radically different organisms, that’s a sure sign that it is a useful adaptation! Some species of fish undergo metamorphoses similar to those of the tadpole. Though those changes are not so dramatic, they can result in changes in the fish’s food source, its body plan, and where it’s able to live. Just like the more drastic forms of evolution, this may function to prevent adults from competing with juveniles for food. The salmon, for example, is a freshwater fish in its juvenile form. After undergoing a partial metamorphosis, it becomes a saltwater fish. When thinking about this process it is important to keep in mind that all organisms must regulate their salt/water balance. This is why humans can’t drink seawater without dying: the salt would overwhelm our cellular chemistry, and our cells would not function properly. In just the same way, freshwater fish typically cannot live in saltwater. To become saltwater fish, then, salmon must develop new organs and cellular mechanisms to cope with the salt water. That’s why salmon must perform their annual migration upstream; adult salmon live in the ocean, but their eggs must hatch in fresh water in order for the juveniles to survive. That means that adult salmon must leave their homes in the ocean for freshwater rivers, and swim as far upstream as possible before laying their eggs! Flounders, bizarrely, undergo a metamorphosis in which one of their eyes and nostrils move from one side of the head to the other. As juveniles, flounder look much like most fish: they swim vertical relative to the current, with one eye and one nostril on each side of their bladelike body. This body type allows them to swim fast like most other species of fish. But in adulthood, flounder are flat fish which camouflage themselves by swimming on their bellies, pressed against the sea bed. To accomplish this lifestyle change, juvenile flounder essentially flip over on their sides and make one side of their body into their belly. Through cellular changes, the eye and nostril from the belly side actually migrate to join the other eye and nostril on what is now the “top” side of the fish. Evolution sure has some creative ways of doing things! 1. Why do scientists think that insects evolved metamorphosis? A. Prior to evolving metamorphosis, insects lived their whole lives as worm-like larvae. The advantages to growing wings are obvious. B. An accident in embryonic development may have led to some insects hatching from their eggs before they had taken on adult form; this may have allowed them to spend more time growing without competing with adult members of their species. C. By preventing adults from competing with juveniles for food and other resources, metamorphosis may result in more members of the species surviving to sexual maturity. D is correct. B and C are both correct. Answer A is incorrect; before metamorphosis, insects actually lived their whole lives in their adult form, not their larval form! 2. Is a butterfly holometabolous, or hemimetabolous? B is correct. “Holometabolous” comes from the Greek word “holo,” for “whole” or “complete” and “meta” for “change.” Butterflies certainly do undergo a complete change during metamorphosis! 3. What can we say based on the fact that both insects and frogs undergo metamorphosis? A. All species originally underwent metamorphosis, but the ability was lost by some. B. Frogs and insects must have evolved from a common ancestor that underwent metamorphosis. C. Metamorphosis must have evolved twice independently, since it appeared in insects long after their lineage split off from that of frogs. C is correct. Fossil records show us that ancient insects did not undergo metamorphosis; the ability must have been “learned” by the species a few hundred million years ago. Frogs appear to have developed metamorphosis independently, making this an example of convergent evolution. Gilbert, S. F. (1991). Developmental biology. New York: Plenum Press.